The Broadway Street pond on the afternoon of Oct. 27. 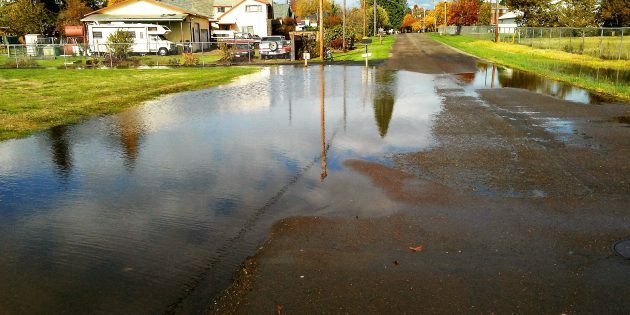 City and county officials have taken note of the water problem on Albany’s Broadway Street S.W., and they are trying to do something about it. Neighbors say the ponding on a short section of the street, at the 2300 address, is new this fall. A couple of reports on the situation appeared here last week. Since then I’ve heard from Chris Bailey, the Albany Public Works director of operations, and from Linn County Roadmaster Darrin Lane. As it happens, the ponding is in one of the city segments, according to the map. Lane says the county wants to help figure out how to solve the problem. And if the ponding is caused by the collapse of a drain line that runs from there toward Queen Avenue, which seems like the most obvious cause, the Department of Energy would have a role in getting it fixed. The drain line is shown on maps I found in a 1983-84 health-physics assessment of the 14-acre “Back Forty” meadow of the federal Albany Research Center, which lies on the east side of Broadway. According to the report, the line was installed in the 1960s along with an extensive drain field in the vacant land. Bailey says the city public works staff has been on the scene several times to deal with the ponding and have discussed it with the county. “From our discussions with the county, it appears that something has changed with the drainage on the DOE property that has caused the runoff to pool in that location,” she wrote in an email. Would it be cheaper to just stock it with trout and call it good? Perhaps. As long as nobody eats them or the four headed, mutated toads. Ugh! On a completely different track, it appears that the “guvment” is acting and responding. A good thing! Yes? Doing good. Credit to HH lighting a fire under some butts. Saw the puddle was actually bubbling up today near one of the driveways. Hope they find a solution quickly. Any explanation for the odd division of city/county jurisdiction? Or the annexation of those particular properties?